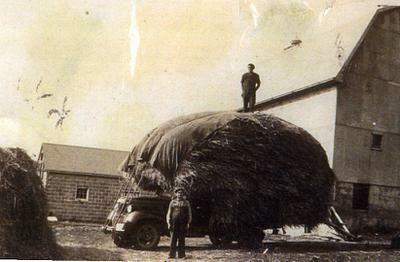 This is a picture of my grandfather, John Buldyke, (standing on ground) and my father, Fred Buldyke, with a wagon load of hay at their farm on Hwy. #7, west of Brooklin. (Lot 31N, Conc.5) The picture would have been taken in the late 1930's or early 1940's. The barns had been built in 1937. John Buldyke Farm, late 1930's, Brooklin, Ontario, Photographer Unknown. Whitby Archives D2015_001_002. My grandparents’ farm originally consisted of 50 acres of land with Lynde Creek and ten acres of woods at the south end of the property and 40 acres of stumps that needed to be cleared at the north end of the property. My paternal grandparents purchased the land in 1925 for $5000. They built their first home that had no hydro or running water at the top of the hill by the creek at the back of the farm. Then they set to work clearing the land of stumps using horses and chains so that they would be able to farm the land. Before moving to their farm in Brooklin from their house in Oshawa, my grandfather worked at Ontario Malleable in South Oshawa. Until he was able to make a living by farming, he kept his job in at Ontario Malleable. To get to work in Oshawa, he would walk along the Canadian Northern Railway tracks that were behind their farm every Sunday evening. In those days, the railway bridge crossing Devil’s Den was still there so that our grandfather could walk across the bridge instead having to climb of up and down the gully and worrying about crossing Lynde Creek. He would board in Oshawa during the week and then walk home after work on Friday afternoons. After the land was cleared, they grew raspberries and planted an apple orchard that was taken out around 1958. In 1937, the large steel barn in the picture was built for their cattle and horses and the attached two-storey cement block barn was built to house pigs at the ground level and chickens upstairs. After the barns were built, my father’s family built the brick house at the north end of the property where my siblings and I all grew up. After the property was sold in the early 2000’s, the house was later transformed into the present-day (2015) clubhouse for the driving range. When my grandfather died in 1949, my father purchased the farm from his mother. It is where my father and mother lived after they were married and is also where my siblings and I all grew up. My parents continued to grow raspberries and later corn, along with other vegetables over the years. For many years until the 1990’s they had a fruit stand at the front of their property where my mother spent many hours and days working. Our family farm was sold in the early 2000’s after my father died. The new buyers turned it into the present-day Devil's Den Driving Range. (The farm backs onto Devils Den.) The main barn still exists, but has been renovated. The farmhouse still exists too, but has been transformed into a clubhouse.